A "Classic" 53 Hatteras Triple Cabin Motoryacht. She is well built/heavily constructed with pretty lines and could make a fabulous liveaboard or an economical and spacious Islands/Great loop Cruiser. Her Twin 350HP 871N Detroits (No turbos/no aftercoolers) and Seller estimates 1-1.25 GPH fuel consumption at slow cruise. Her triple stateroom layout offers a large Hardtop enclosed furnished aft deck, wet bar, wing doors to walkarounds. Forward in the Aft Deck deck is the lower helm station which is set up "Pilothouse" style with Centerline helm with good visibility and deck access doors port to port and starboard. As you go forward and down 3 steps you come to a fully equipped galley. the forward guest stateroom features Vee Berths to starboard and an additional bunk to port. The forward head has been converted to a walk in closet/storage locker but could be easily converted back to a 3rd head. Traveling aft through a companionway to the Staterooms to port and starboard of the companionway are access doors for and aft to the engine room. Just aft of the engine room is the 1st guest head which features a stall shower which is also shared with the port side guest stateroom/office. The portside guest stateroom featured side by side bunks but the outboard bunk has been converted to a desk/workstation. Portside stateroom head is across the companionway. The master stateroom is aft with Queen Island Berth jutting out from port side hull, Full double hanging lockers, and private head. Hull and topsides in very good condition for a 1973 vintage boat and the boat has been well kept and updated by her owner. "Some designs succeed so well in the marketplace that they earn the distinction of being industry classics. 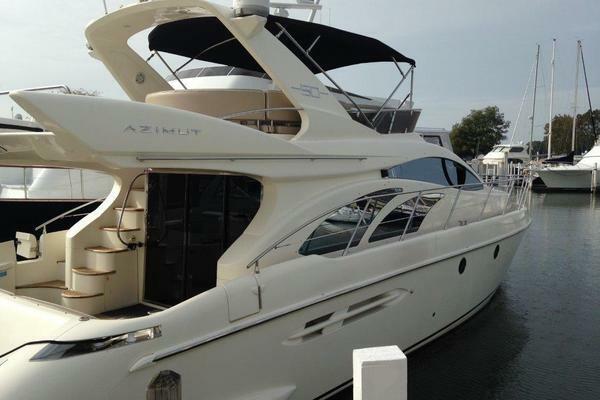 Such a boat is the Hatteras 53 MotorYacht. Two decades in production, the Hatteras 53 MY became the standard by which other motoryachts in her size range were measured. 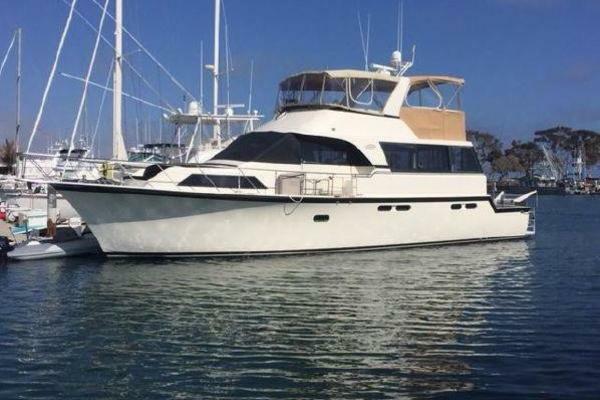 Her bi-level, 3 stateroom,3 head floorplan is considered ideal in a motoryacht of this size and the split engine rooms soon became a Hatteras trademark. 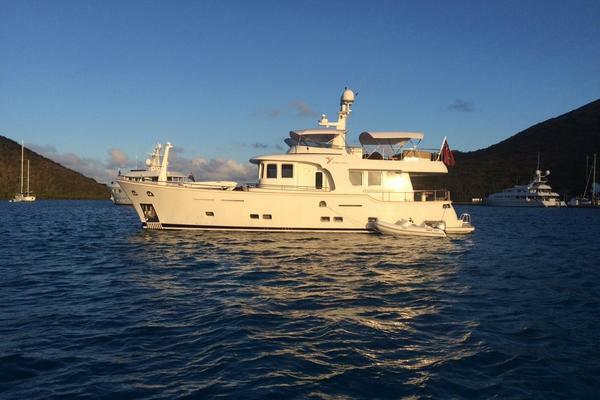 Resale values for 53 Hatteras Motoryachts remain strong in ALL markets"
Three stateroom, three head layout. Modified mid cabin has 1 bed & custom office desk, forward head converted to pantry. Master Stateroom is aft with queen berth. NOTE: Forward head has been converted to a full hanging locker/storage area but could be easily converted back to a 3rd head. Traveling aft through a companionway to the Staterooms to port and starboard of the companionway are "walk in" access doors fore and aft to the engine rooms which are across from each other in the companionway. Just aft of the engine room is the 1st guest head which features a stall shower which is also shared with the port side guest stateroom. The portside guest stateroom featured side by side bunks but the outboard bunk has been converted to a desk/workstation. Portside stateroom head is across the companionway. The master stateroom is aft with Queen Island Berth jutting out from port side hull, Full double hanging lockers, and private head, Full row of hanging lockers, drawer/locker storage port,starboard and aft.